Sunbrella® from Glen Raven Mills has been the industry’s best performing outdoor fabric for decades. While a bit more pricey than the lower priced umbrella fabrics, Sunbrella’s® minimum 5-year warranty against fade makes this choice the most cost-effective in the long run. 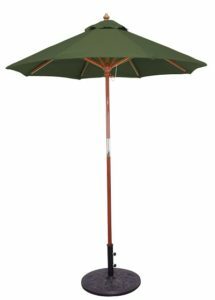 You can buy a standard poly canvas patio umbrella every year to replace it as it fades, or purchase just one that will last for at least 5 years. Sunbrella customers will rarely settle for the cheaper materials. We scale down the cost of a Sunbrella® patio market umbrella by making them one at a time, thus eliminating costly inventory storage.The cost savings is not the only benefit to you. 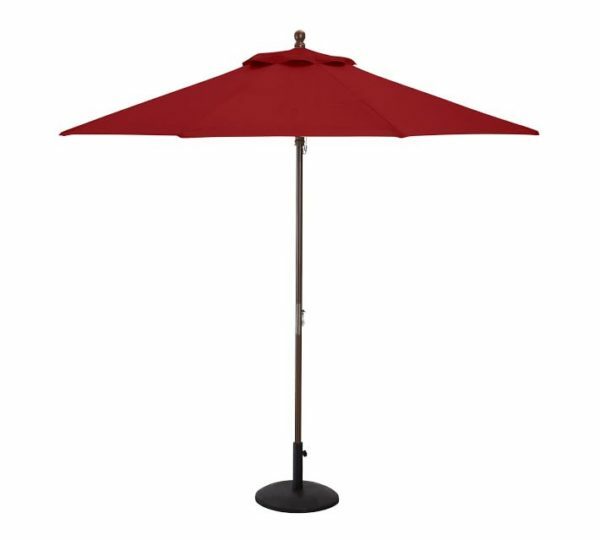 We can match any of our stock umbrella frames to any Sunbrella® solution dyed acrylic fabric choice in any price and size range. See bullet list below for details. We also assist in scaling down the selection process by providing expert advice throughout. Call our Sunbrella® pro Mark Taylor now at 480-600-1049. Need matching patio cushions. Call now for a quote. Prices reflect any 5400 series Sunbrella® fabric. Sunbrella® uses a fabric name and item number, example: Canvas Antique Beige 5422. We can make your custom patio umbrella using any Sunbrella® fabric selection. Call to get a quote on any other-than-5400 series option. Click here to visit Sunbrella’s® digital swatch book. 9′ aluminum frame, 8 ribs 1.5″ diameter pole with crank lift and manual tilt available in these frames finishes: antique bronze, chocolate brown, brushed silver, black or white. Brushed silver and antique bronze also available with rope/pulley lift, no tilt: $209.95. We offer an auto tilt option in the antique bronze option at plus $10. 11′ aluminum with 1.5′ pole diameter, crank lift, no tilt in antique bronze frame finish: $259.95 Auto tilt option is available at plus $10. We even have custom logo silk screening available (minimum imprint is 12). Call for details and pricing on custom branded patio umbrellas. This is a custom made patio umbrella and is non-refundable. Please allow us 2-3 weeks to order the fabric, cut, sew and ship. SKU: 565. 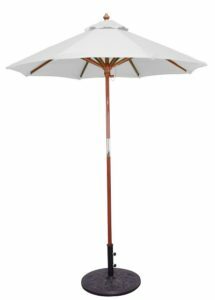 Categories: 11' Foot Patio Umbrellas, 6-8' Patio Umbrellas, 9-10' Patio Umbrellas, Aluminum Patio Umbrellas, Commercial Grade Patio Umbrellas, Fade Resistant, Patio/Market Umbrellas, Sunbrella®patio umbrellas, Tilt (all), Wooden Patio Umbrellas.